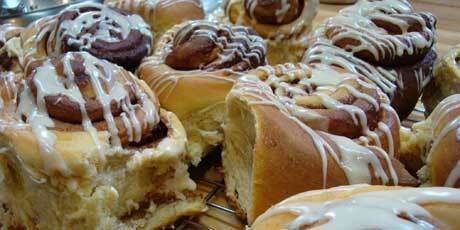 Delicious homemade cinnamon rolls by Michael Smith. You might also like these Sweet Cinnamon Recipes. 1. In a small pot gently warm the milk along with 1 stick of butter, 1/2 cup of brown sugar, the vanilla and the salt. Don’t bring to a simmer, warm just enough to melt the butter. 2. Meanwhile measure half the flour into the bowl of a stand mixer along with the yeast. Add the warm melted milk butter mixture to the flour, beat with a paddle attachment until smooth. Add the eggs one at a time, beating until smooth before proceeding. Switch to a dough hook and add the remaining flour. Knead until a soft dough forms that is no longer sticky to the touch, about five minutes. Rest the dough in a warm place, covered in a lightly oiled bowl until it doubles in size, about one to two hours. 1. Knock the dough down and let rest for a few minutes. Meanwhile thoroughly mix together the room temperature butter with 1 cup of brown sugar and the cinnamon. Flour your work surface, the dough, your hands and a rolling pin. Roll out the dough into a long rectangle shape, about 18 x 12-inches. Evenly spread the cinnamon butter over the top of the dough leaving an inch or two uncovered along one long edge. This will help a seal form. Roll tightly into a long cigar shape from the covered long edge to the uncovered long edge. Brush the outside of the log with oil or melted butter. 2. Slice the dough log into 12 or 16 sections. Turn each on its side and position evenly in an appropriately sized lightly oiled baking pan. Rest, uncovered, until the dough doubles in size again and the rolls swell into each other. 3. Meanwhile preheat your oven to 350ºF. When the dough is ready, bake for 30 to 35 minutes. 1. When the cinnamon rolls have cooled enough to handle stir together the glaze ingredients and drizzle all over them. Serve immediately!